We are excited to announce that last week we launched the localized Spanish and Greek versions of our homepage. 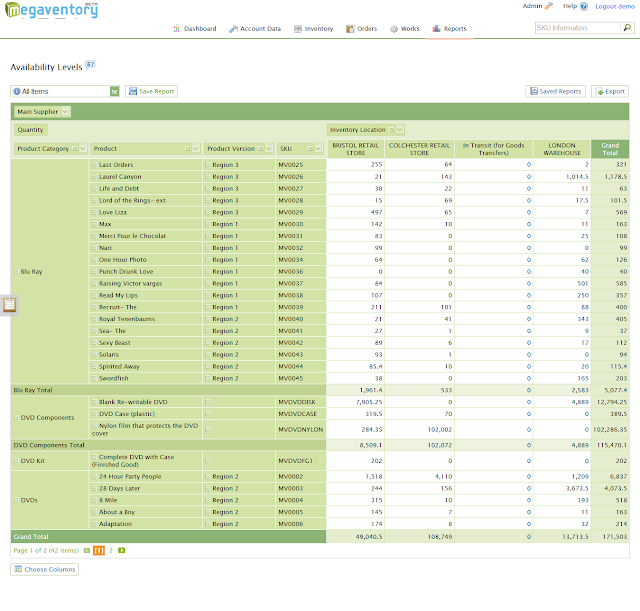 The Spanish version can be found at http://es.megaventory.com and the Greek version at http://el.megaventory.com. 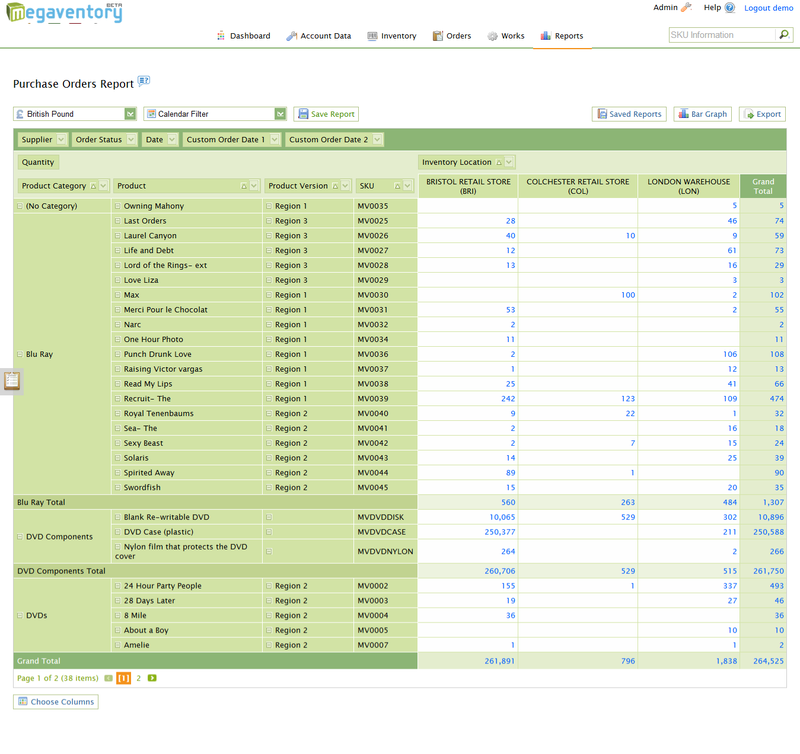 On top of that, we developed specific pages to cover industry verticals that Megaventory is really good at. For example, a page dedicated to franchise chains that sell physical products can be found at http://www.megaventory.com/solutions/Franchise. 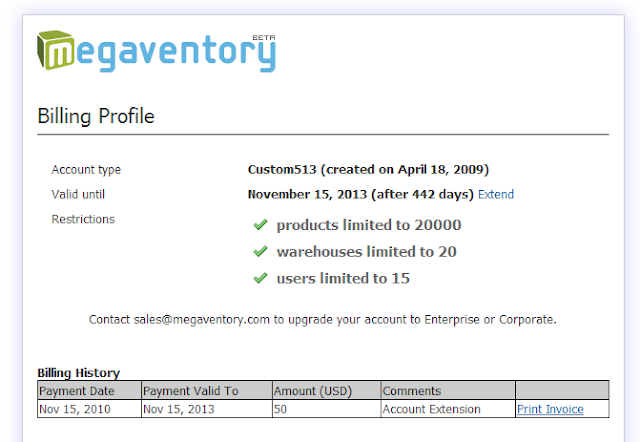 Similarly, a page dedicated to small manufacturing companies can be found at http://www.megaventory.com/solutions/Manufacturing and a page for Small Office - Home Office businesses (1-2 person businesses) can be found at http://www.megaventory.com/solutions/SmallBusiness. Finally, a page for companies selling consumer electronics can be found at http://www.megaventory.com/solutions/Electronics. We believe that this addition -and forthcoming ones- will make it easier for non-English speaking visitors of Megaventory. We just went ahead and published an analytical technical manual to describe the operations of the modules of megaventory. 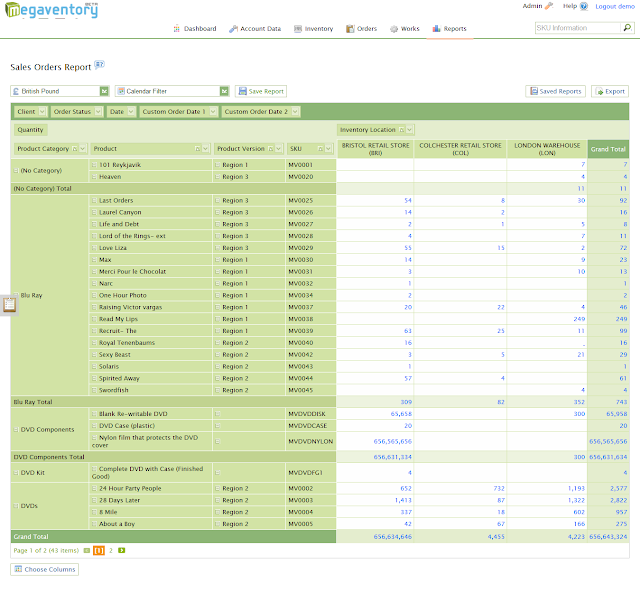 We believe that the documentation will help both new and existing Megaventory users. After you’ve set up an ERP solution for your business, are comfortable with its basic functions and the routine it enables for your company, it’s time to take the next step. Namely, answer the question of how I will allow my company to run better, how will I optimize it? Surely, that’s a broad problem and there’s lots of things that can be done depending on many factors. The one thing though that is necessary to have before you can even begin to break down the problem is data. In other words, if you want to reach any meaningful conclusions about your company, you need to drill down in what’s called business intelligence and make reports which will allow any problems and pain points to come to the surface. 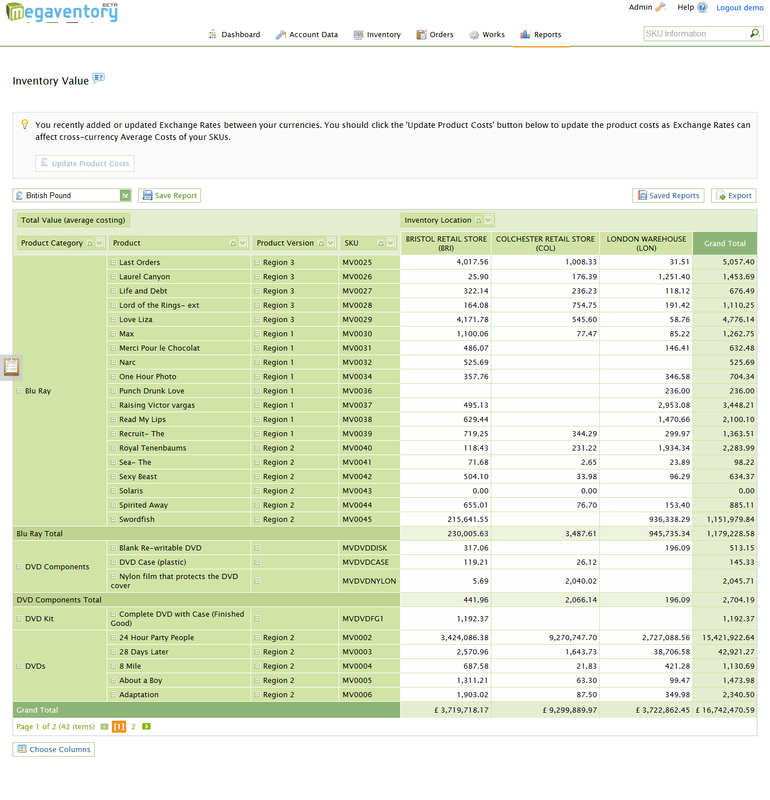 Any ERP software should be able to make at least a number of basic reports which should also be customizable across time and all other relevant factors (locations, products and their value, etc). 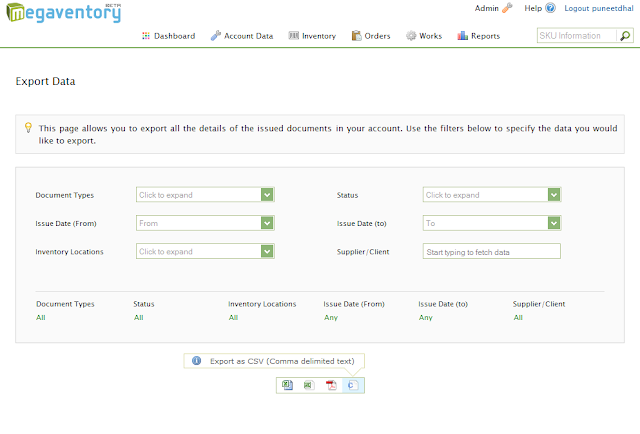 In megaventory, it’s easy to create the following types of Reports - easily selectable from the top menu. In one handy report you can have the full information regarding the current state of your inventory across all of your locations, your products (and any versions/types of them) including obviously goods that are in transit. 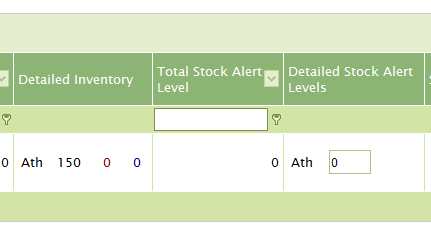 This allows for real-time tracking of your inventory, supplements you with all the information necessary to make timely purchase orders and ensures you don’t run out of stock (although setting up alerts for certain levels also helps prevent that). This helpful report allows you to drill down across time and across your product range and categories in order to understand the products that are the most and least profitable and how that changes with time. Although any manager will know the best and worst sellers without even looking at the report, such information allows for other less obvious results to surface. 3. Inventory Value. 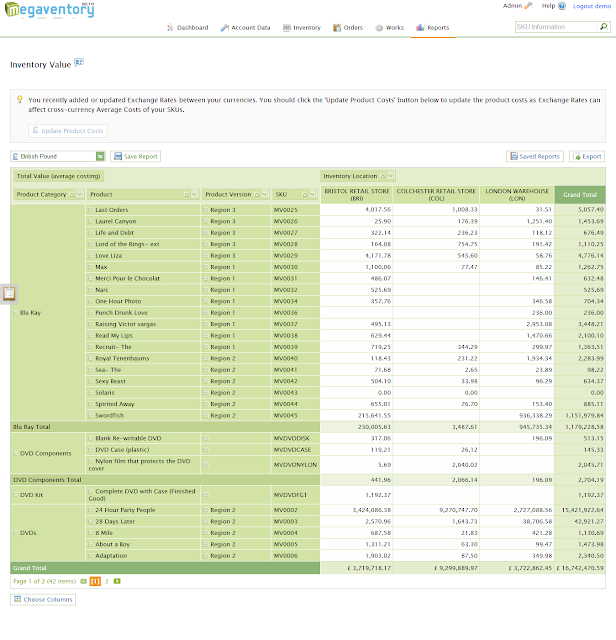 This is another important report that breaks down the value of your products per the location they are stored and allows you to constantly be able to track your company’s assets - a factor crucial for keeping your financials accurate and consequently making solid business decisions. It’s important to be able to tell which of your products move the most and this report is the one to create if you’re after this information. In conjunction with the next two reports, you can understand far more about your business than the general impression you get from following the everyday process - or what accumulated experience may indicate. Knowing which product is bought or sold the most per location is another very practical bit of information allowing you to make corrections to the way your business runs. For example, locations that seem to sell a certain product more may need support (another supplier close to them or perhaps another store in the future), products being sold showing a spike at a particular location may indicate an opportunity and so on. The number of conclusions from studying this type of reports is virtually unlimited. If manufacturing plays a role in your business, understanding how relevant figures such as quantities, costs etc change with time for each of your product and its components can also provide tons of information on how to improve your work flow. Having collected all of the necessary data is usually just the first step - although obviously without it no further progress can be made. Once you have the basic numbers you can move on to either combine them, find out more detailed data, review and evaluate the performance of your staff, extrapolate them to try to forecast your future needs, etc. In any case such reports are an essential measure to start understanding your business - otherwise you’re essentially flying blind. A case in point is the Eastern European Mission, an NGO which helps spread the Bible to those who need it. Since the project spans a number of countries in the Eastern European region, tracking inventory levels and having a complete and real-time image of where is what and associated costs is extremely helpful. It allows the EEM to take their efforts to the next level by minimizing their logistics overhead and focusing more on their core noble goal. We haven’t done an industry roundup post in quite a bit now and it’s time to see what’s going on in the outside world. Here are a few news items worth absorbing. Traditionally, one of the industries among those that affect a business which resist the most against change is the finances/accounting department. It has been clinging to the on-site ERP model for a long time but CFOs now shift towards the cloud as well. Companies such as Workday (recently many financial extensions went live), Adaptive Planning (which acquired business intelligence reporting MyDials) and NetSuite (driving its billing module sales without ads) have all been making moves to invest on the cloud. Karin Wilson of Software ThinkTank points out another excellent argument why cloud ERP makes more sense than traditional hosted solutions - it’s greener! Based on a study, having less infrastructure in-house (servers etc) not only means less money on energy bills but also a reduced carbon footprint. So if the environment is a priority for you, there’s a another reason to go to the cloud! Network World has a nice - but lengthy - piece on our favourite latest trend by which business software is becoming increasingly more consumer-like - think using an inventory management service that’s as intuitive and user-friendly as using Facebook. Only the piece takes it one step further: forget consumerisation, it’s about gamification! Soon doing work on your business software will have similar features as playing a game - keeping score, earning badges, involvement of virtual goods and currencies, etc. Can’t wait for the game to start? Have you found any bits of news worth sharing? Share them in the comments below or on Twitter @megaventory. Sales is the arguably the lifeblood of your business and efficiently handling the sales order your customers issue is as such crucial. 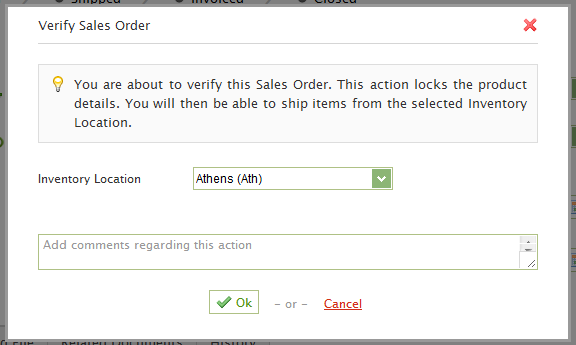 Here’s how easy it should be to issue a sales order. 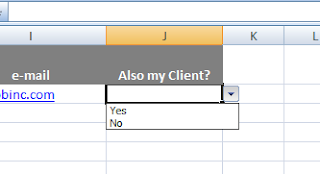 Once picked, you need to choose the Client that is to receive the Order - simply typing the first couple of letters should be enough to bring the details and auto-complete half the form. 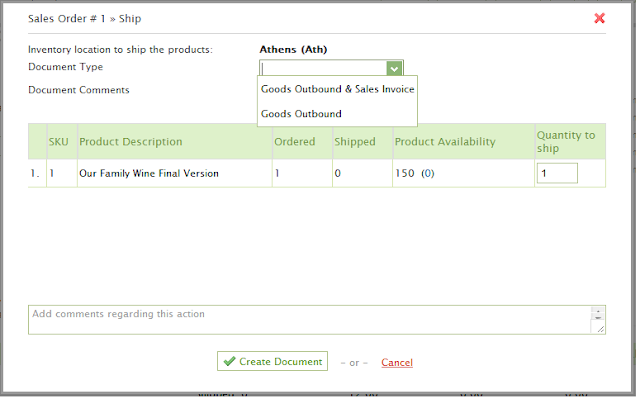 The other half can be filled by completing product details - such as the product code (SKU) or the product description along with other applicable details. 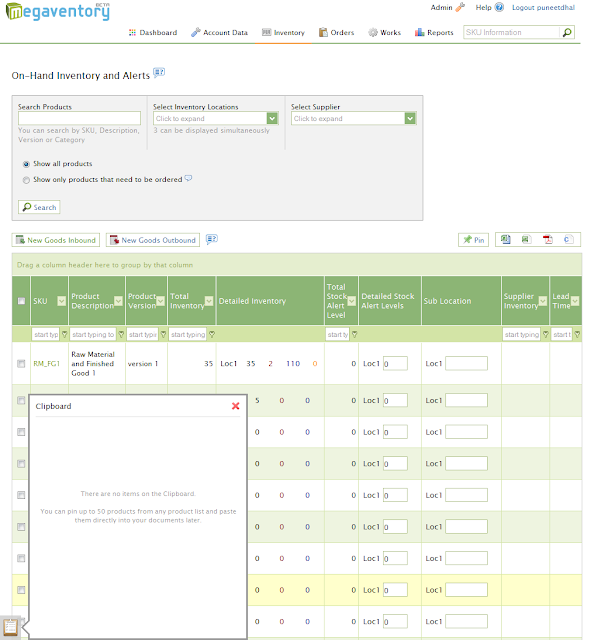 Stock information is also readily available in real-time to notify you from selecting a low-stock product or sending the item from the wrong location. Once product details have been filled in, click on 'Verify' to lock the product details of the Sales Order. The only thing left is to decide whether the action will be recorded as just a change in the inventory or whether an invoice will be issued as well. The former is useful in the case of a Sale on Consignment (explained below in this post). 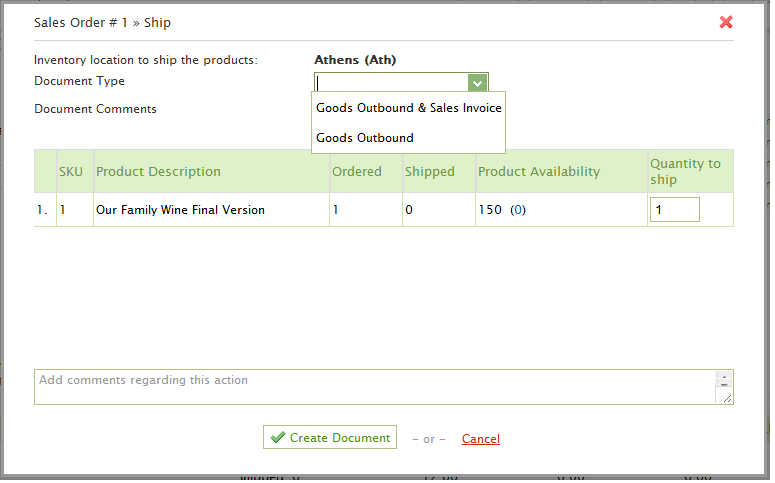 Closing the Sales Order will make the Sales Order and all the documents that were created against the Sales Order strictly non-editable. That way -in a few minutes- you can start and complete a Sales Order to one of your clients! 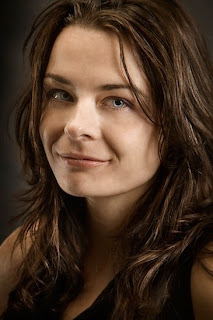 A megaventory client that uses the feature efficiently is infraredsauna.com. Infrared Sauna is a US-based company in the business of innovative infrared light saunas (instead of the conventional steam ones) with sales from all over the world and partners in 3 other countries (Australia, Belgium, Malaisia). With such a varied and wide network of business it is crucial to handle orders efficiently - especially given that saunas are expensive and hard to transfer due to their size (so ordering and inventory mistakes are not an option). Another popular type of sale is by consignment, i.e. when your business has transferred your products to a seller (e.g. a shop) while still owning them. 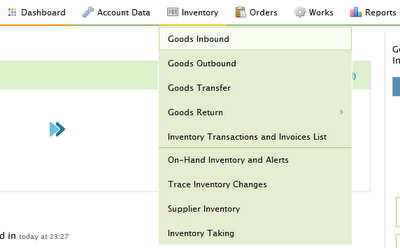 It’s only when the seller manages to move your product that you issue a Sales Invoice to the client. This way of making sales can also be handled by the above Sales Order system - just by appropriately choosing the Document Type to issue upon shipping. 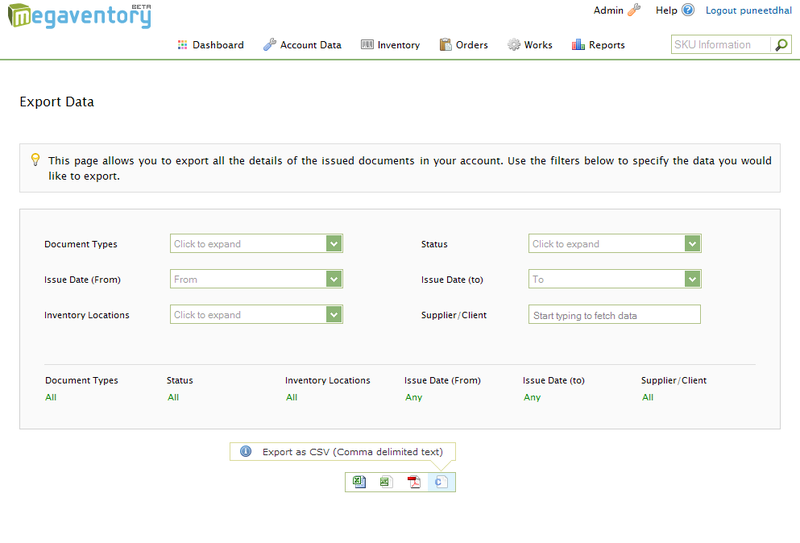 Invoicing of the shipping documents can then be performed at a later time. For example, lomography.co.il, an Israel-based online shop about lomographic cameras and accessories. Apart from the e-shop, the business sells their product via a number of other physical retail shops in the city of Tel Aviv and Jerusalem, while they cooperate with labs which help customers develop their films. This means there’s a need to track where is what across a network of quite a few locations and for a highly specialized product line. That’s something that could translate to a huge administration overhead but is made easy with inventory management software. Most of the times however and unless we’re talking about an established relationship with your customer a sales quote must take place before the actual order happens. Sales quotes should ideally transition seamlessly into sales orders if accepted - you can see how this should flow in this post on pre-sales. And of course in order to make sales you have to make a purchase first (either of the product itself or the materials its made of). 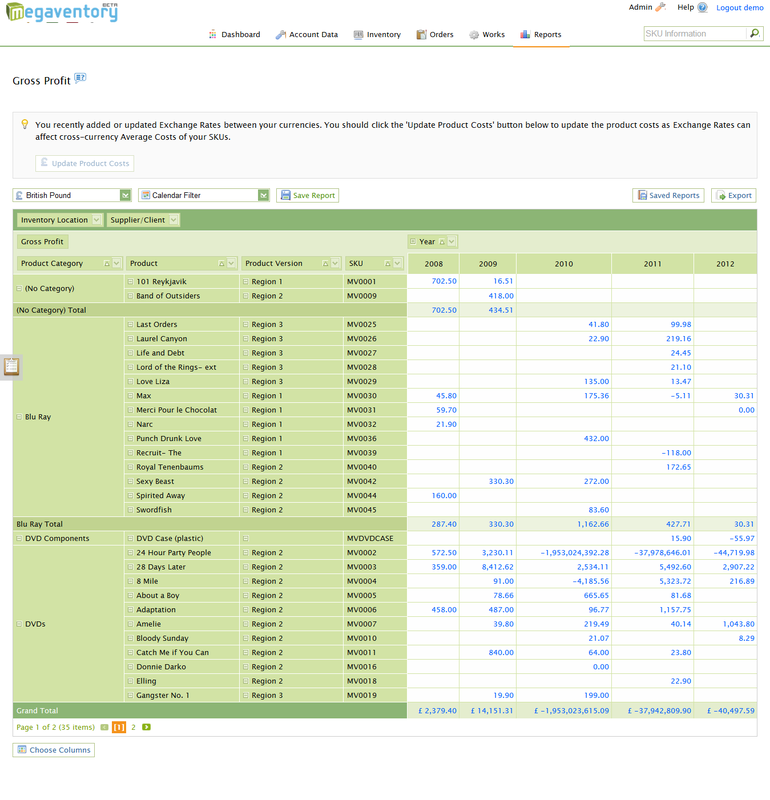 That’s why a proper ERP package comes with a function called Purchase Order (or an equivalent). That’s essentially the opposite of a Sales Order by means of which your business purchases products (or materials) from a supplier and your inventory levels increase accordingly. You can see examples of all three functions (sales, sales quotes and purchases) in this short tutorial video. 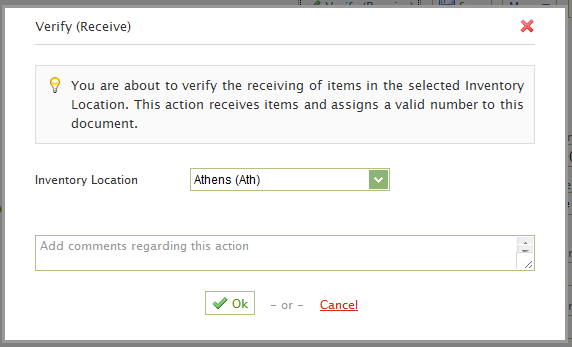 To Pin products to the Clipboard, one has to select the products from a list and click the Pin option. After pinning the products, a small notification icon is added which displays the number of products pinned and the product list is populated inside the Clipboard. Once you are done adding products to the Clipboard, you can paste them in any New/Unsaved or Pending Document. To do so, just click on the Clipboard icon and select the Paste option. 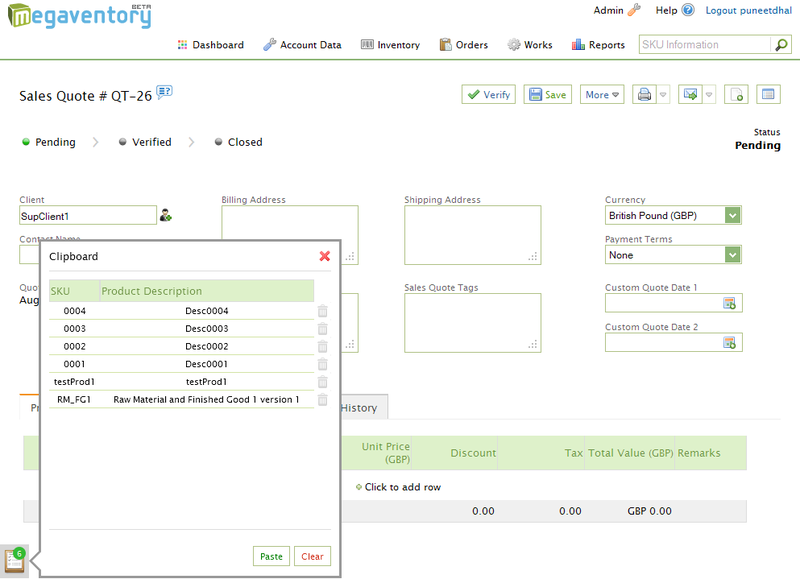 this is extremely handy if -for example- one needs to copy the full contents of a Sales Order to a Purchase Order. Apart from the features listed above, as always, we've worked hard to eliminate bugs; more than 30 minor bugs have been fixed in this upgrade. To have your say related to this upgrade, just use the comments section below! This is a somewhat technical post targeted at website administrators and developers. The post breaks down the process of creating an 'uptime monitoring' page which can be extremely useful to Software-as-a-Service providers such as Megaventory. The % of up-time is a crucial factor that refers to the period of time when the service is up and running. Needless to say, this metric should be taken into account by users evaluating any SaaS provider. A simple google/bing search will do the trick here. We decided to use the service by www.uptimerobot.com. This is a reliable (we have been using it for 3 years now) and free service that provide -amongst other features- email notifications and an API layer. We use the latter to fetch service data in our uptime monitoring page later on. (kudos to this post: http://stackoverflow.com/questions/2499567/how-to-make-a-json-call-to-a-url). - We request the uptime percentages for 7, 30 and 365 days and we pass this info to the url as: 'customUptimeRatio=7-30-365'. You may set your own custom periods. - Finally, we call the drawChart() function that is included in the Google Chart Tools (https://developers.google.com/chart/) and we pass the ArrayOfUptime to it: drawChart(ArrayOfUptime). That generates the correct percentage values in the Gauge graphs (see step 3 below). the chart.draw(data, options); is the call that sketches the graphs. On many occasions, especially if the service is down, adding a Twitter stream provides an easy source of useful information about the service, for example, the expected time when the service will be up again! To add it, we use the native twitter widget which can be customized easily. It can be found at: https://twitter.com/about/resources/widgets. - The server response time should be visible only if the status of the server is operating normally (status==2 in our case). If there is a service disruption, there is no need to display the response time. - We use a tiny image (an 1KB, 1x1 pixel 'NoImg.gif' in our case) and we place it in a folder where the application resides (for example megaventory.com/images/). After we finish with all the coding and widgets, we need to publish our index.html file. A good and fast way to make the file available online is to add it in the public folder of your drop-box folder. This will assign a unique URL to it (for example https://dl.dropbox.com/u/XYZ/index.html) and you may send the link to your friends for a review. Once everything is finalized, you can publish it officially using the standard monitoring page URL which looks like http://status.YourCompanyName.com. The status URL must resolve to another hosting environment than the one your application is hosted at. The reason is obvious: if your hosting environment goes down, users should still be able to look up your application status and twitter stream. The web is full of options for hosting a static html page. We use FastMail (http://www.fastmail.fm) for managing our e-mail & DNS, and hosting the monitoring page as it provides a 50MB web space for static html pages. So how does the end result look? See for yourself at status.megaventory.com. Feel free to provide your feedback in the comments section below! Business software should mean customization - Printout templates. 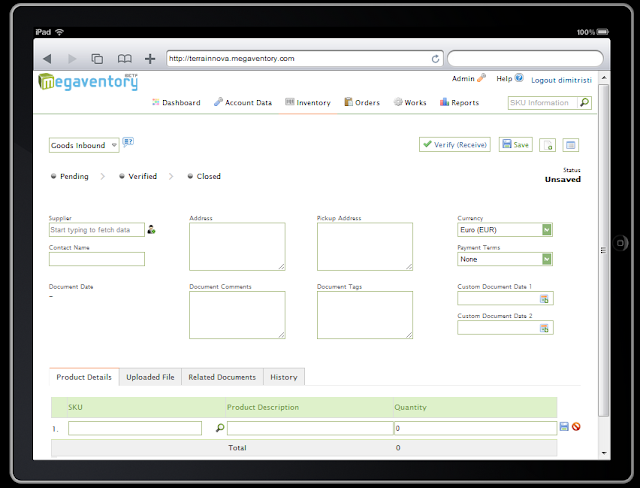 Most of the feedback we get from time to time refers to the level of customization that megaventory provides to the end user. In fact this is also one of the main points the Pemeco Consulting and VM associates have made in the respective presentation posts in our blog: "match the software to the requirements of your business and not vice-versa". In this post we'll see how one can customize the appearance of the document printouts. If you are unfamiliar with megaventory, a document can be a Order (Sales/Purchase), a Sales Quote, a Goods In/Out or a Sales/Purchase Invoice. xxxLOGOxxx - Replaced by the logo of your company. xxxLABEL_TRANS_DATExxx - Replaced by "Document Date" or "Order Date" or "Quote Date", according to the Document Type. xxxTRANS_DATExxx - Replaced by the date that the Document was created. xxxLABEL_TRANS_NAMExxx - Replaced by "Document Number". xxxLABEL_TRANS_NUMBERxxx - Replaced by "Document Number". xxxTRANS_NUMBERxxx - Replaced by the Document number. xxxLABEL_WAREHOUSExxx - Replaced by "Inventory Location". xxxWARE_NAMExxx - Replaced by the Inventory Location name. xxxLABEL_CUSTOM_DATE_1xxx - Replaced by "Custom Document Date 1" or "Custom Order Date 1" or "Custom Quote Date 1", according to the Document Type. xxxCUSTOM_DATE_1xxx - Replaced by the Custom Date 1 field the user has entered in the Document. xxxLABEL_CUSTOM_DATE_2xxx - Replaced by "Custom Document Date 2" or "Custom Order Date 2" or "Custom Quote Date 2", according to the Document Type. xxxCUSTOM_DATE_2xxx - Replaced by the Custom Date 2 field the user has entered in the Document. xxxLABEL_PAYMENT_TERMSxxx - Replaced by "Payment Terms". xxxPAYMENT_TERMSxxx - Replaced by the Payment Terms the user has entered in the Document. xxxLABEL_COMPANY_NAMExxx - Replaced by "Company". xxxCOMPANY_NAMExxx - Replaced by the name of your company. xxxLABEL_COMPANY_ADDRESSxxx - Replaced by "Address". xxxCOMPANY_ADDRESSxxx - Replaced by the street address of your company. xxxLABEL_COMPANY_CITYxxx - Replaced by "City". xxxCOMPANY_CITYxxx - Replaced by the city of your company. xxxLABEL_COMPANY_ZIPxxx - Replaced by "Zip". xxxCOMPANY_ZIPxxx - Replaced by the zip code of your company. xxxLABEL_COMPANY_COUNTRYxxx - Replaced by "Country". xxxCOMPANY_COUNTRYxxx - Replaced by the country of your company. xxxLABEL_COMPANY_TELxxx - Replaced by "Phone". xxxCOMPANY_TELxxx - Replaced by the telephone number of your company. xxxLABEL_COMPANY_TAXIDxxx - Replaced by "Tax ID". xxxCOMPANY_TAXIDxxx - Replaced by the tax ID of your company. 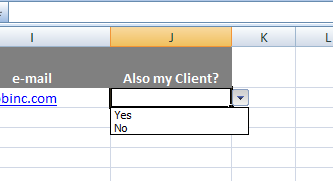 xxxLABEL_CUSTOMER_NAMExxx - Replaced by "Client" or "Supplier" according to the Document Type. xxxCUSTOMER_NAMExxx - Replaced by the Customer/Supplier name the user has entered in the Document. xxxLABEL_CUSTOMER_ADDRESSxxx - Replaced by "Address" or "Billing Address" according to the Document Type. xxxCUSTOMER_ADDRESSxxx - Replaced by the Customer/Supplier address the user has entered in the Document. xxxLABEL_CUSTOMER_SHIP_ADDRESSxxx - Replaced by "Pickup Address" or "Shipping Address" according to the Document Type. xxxCUSTOMER_SHIP_ADDRESSxxx - Replaced by the Customer/Supplier shipping/picking address the user has entered in the Document. xxxLABEL_CUSTOMER_TELxxx - Replaced by "Phone". xxxCUSTOMER_TELxxx - Replaced by the Customer/Supplier telephone number. xxxLABEL_CUSTOMER_EMAILxxx - Replaced by "e-mail". xxxRECIPEMAILxxx - Replaced by the Customer/Supplier email. xxxLABEL_CUSTOMER_TAXIDxxx - Replaced by "Tax ID". xxxCUSTOMER_TAXIDxxx - Replaced by the Customer/Supplier tax ID. xxxLABEL_CUSTOMER_COMMENTSxxx - Replaced by "Supplier Comments" or "Client Comments" according to the Document Type. xxxCUSTOMER_COMMENTSxxx - Replaced by the Customer/Supplier comments. xxxLABEL_TRANS_COMMENTSxxx - Replaced by "Document Comments" or "Order Comments" or "Sales Quote Comments" according to the Document Type. xxxTRANS_COMMENTSxxx - Replaced by the comments the user has entered in the Document. So, enough said! Happy Customizing! Another important parameter to keep in mind is ease of use when it comes to your business software. Now, ease of use can mean lots of things and it’s primarily related to the website design but at a more fundamental level it’s also about to what extent the tool can actually get out of the way and let you get things done. A good example of that not happening is finding yourself either away from the computer or the office and a client or a supplier asking you for specific information that you can only find by looking it up in your system. Up until relatively recently you would have to make a note, put the asker on hold, look up their information and get back to them - perhaps as late as the next day, if not more. And by then the prospective client might have lost interest or found something else or the supplier might have delayed shipping an item and so on. Well, not anymore. These days we’re able to cut down on such downtime and bring the request and its resolution much closer - while at the same time making it all much easier. It’s all about the business software running online (or in the cloud or as a Software as a Service). This means it’s not installed on a particular machine in your office but rather on a server somewhere on the internet and as such you can access it from anywhere you happen to be when a request reaches you, provided you have an internet connection handy. So, for example you may be at home looking after the kids and also keeping an eye on your business' inventory levels from your desktop at home. Or you can be at an errand somewhere waiting at the queue when a customer calls to ask for a particular item - you can look it up on your mobile and get back to them without waiting to return to the office. Business software does not need to have a dedicated tablet or smartphone application or sometimes not even a dedicated mobile version. As long as it’s accessible online you should be able to do all the tasks you need from your tablet or your smartphone - after a brief or no learning curve. Take for example undz.org, a Canadian underwear ecommerce business and a megaventory client with offices in Montreal, Vancouver and New York shipping 250K underwear items in just a year. That averages out to shipping one piece per 2 minutes! It’s not an easy task to reach that scale of business if you haven’t solved issues of accessibility to your business at the best level possible. Another example of a megaventory client is tmdesigncorp, a wholesale screen printing service in Rochester. Although a single-location business, given they work wholesale they have often requests from their clients regarding their own customers and little time to lose to address the request. The ability to have readily available a clear image of the state of their inventory is invaluable to delivering results on time. Overall, going for a business software solution on the cloud means being mobile, always on and ultimately more efficient. It is not an exaggeration to say that an online ERP approach is fundamental in fulfilling your business’ potential. 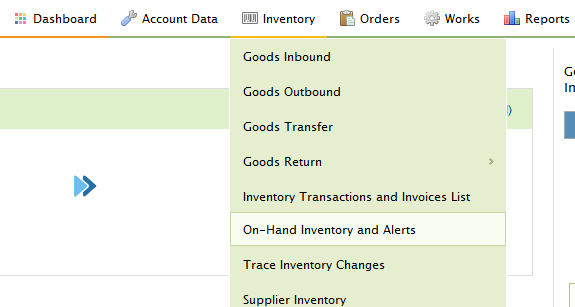 Once you’ve imported your initial warehouse information and are able to look up basic information such as stock levels in your ERP software, perhaps the next most common task you want is to be able to track inbound and outbound items. Simply put, this means adding an item into your inventory levels when it arrives at the warehouse and subtracting it when it leaves. 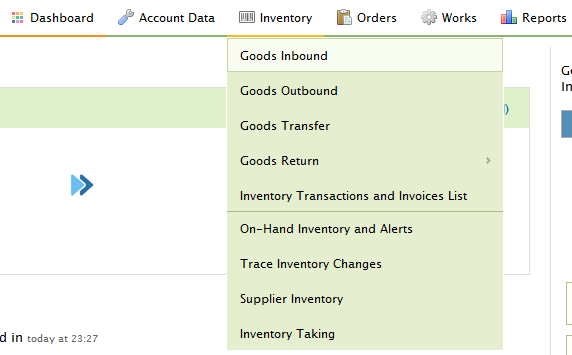 So to do that, just go to Inventory again (intuitively enough) and select Goods Inbound. 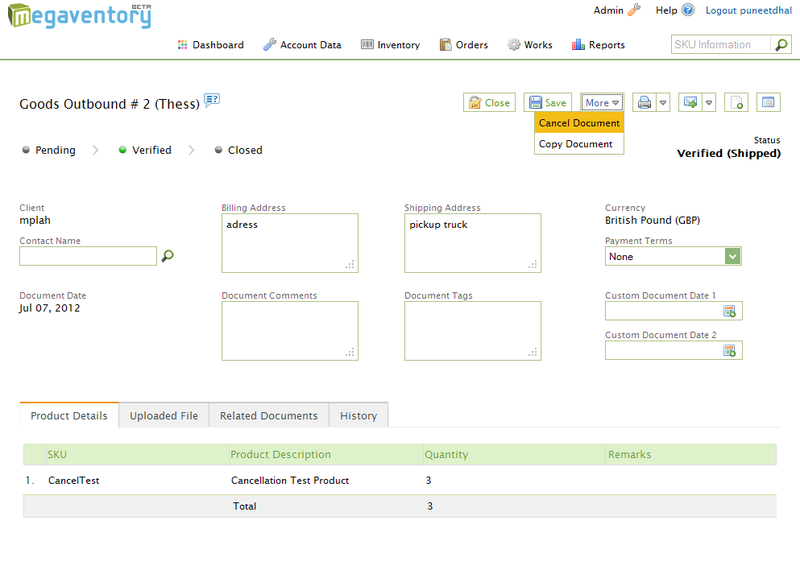 Once there, start typing the supplier, i.e. who’s sending the item which is to be checked in your warehouse. Contact details are also automatically filled in and you’re ready to enter what’s incoming. 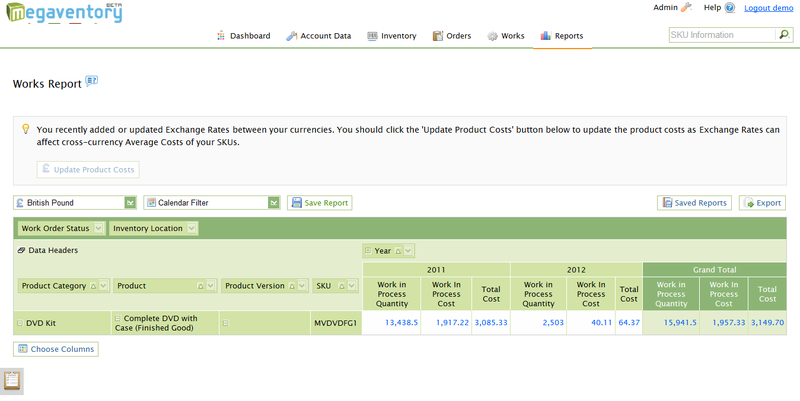 Again, simply type the SKU or if you don’t know the magnifying glass allows you to search for the item. 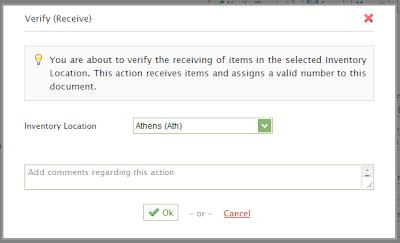 When you finish entering the items click Verify to finaliZe the data entry - or Save for interim saves to make sure you don’t lose your work. That’s it! Your inbound goods are safely stored in megaventory in just a few clicks. Note that you’re informed about which location has how much stock - a significant detail which also saves you time and clicks. A necessary feature when managing your warehouse is to know of course when stock levels are low and need to be replenished (i.e. new orders to be made). The On-Hand Inventory and Alerts option in Inventory easily lets you set such levels to ensure you don’t run out of goods. Overall, running the marketing department of an organisation as complex and diverse as a university requires a systematic approach to make sure the necessary material is always available and there aren’t any unfortunate surprises due to improper warehouse management. Another good - even though totally different - example of a company making use of this core ERP feature is CWB Smart Home Solutions, a Florida, USA based company offering home automation, home theater, home security and home networking solutions. In this case too, CWB has to handle ordering, receiving, storing and consequently shipping expensive equipment on a rolling basis based on their work flow and their clients’ requirements. A quick look on their high-profile work and anyone can understand that there is little room for mistake in ordering products, arrival times, keeping deadline etc. 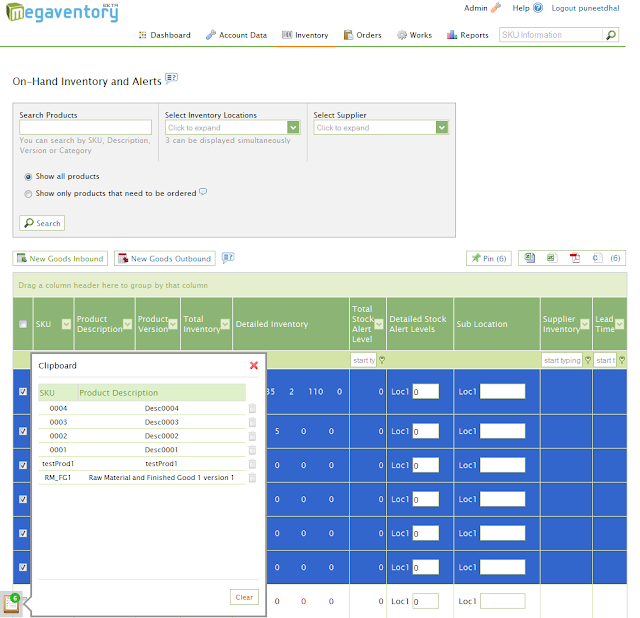 As such a proper inventory management solution is crucial for keeping it all together. This is a quick post showing how easy it should be (and it is with megaventory!) to handle a very common task that hopefully you should have to do all the time. Say for example you’re working and an email arrives or - even better the phone rings - and a customer or possible customer of yours is asking whether you have ‘Our Family Wine’ in stock. Obviously, it’s crucial both to provide them with an answer as soon as possible - preferably within a few minutes if by email or without even putting them on hold if by phone. Any delays past what’s expected might mean a lost customer. So how would you be able to do that in a few moments? To give an answer to your customer just click on Inventory - as expected - from the main menu. Once there the simpler way is to start typing in the top left corner the name of the item you’re looking for. Before you’ve finished searching you’ll have found what you’re looking for in most of the cases! In addition to this simple search, you can look for example by location of your inventory (if, e.g. the customer mentioned their city you could look first in the location nearer him) or by supplier (again following a similar reasoning). Eshanima Fabrics is a South Africa-based small business selling fabric for almost 30 years now with four locations in the country covering the national market. Their product range spans pure linen, premium design fabrics and print base fabrics among others with a wide variety of collections in their inventory. 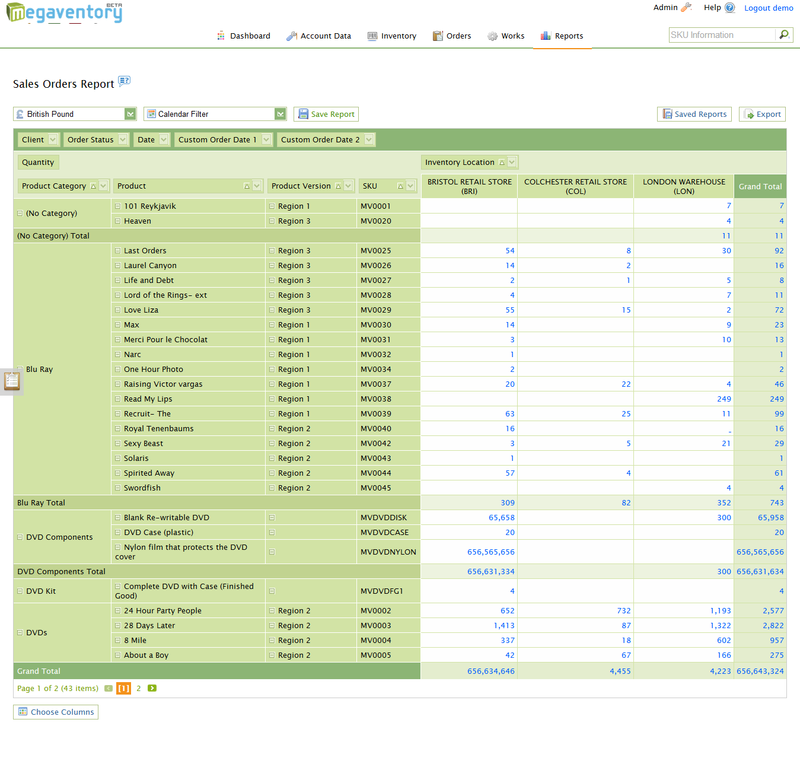 Following the results of the recent customer survey we ran, you all made it pretty clear that one of the most interesting things you would like to see on this blog are practical guides about how to get specific things done in megaventory. Moreover, we’ve asked you to share a typical use scenario in which megaventory makes life easy for you - and lucky for us many of you did. So in this series of posts we’re combining the two types of information into one neat type post: practical guides for typical megaventory uses. First up, is importing your data into megaventory of course. Generally speaking there are two ways to get your data into the service. Firstly, you can try creating the entire data structure piece by piece experimenting as to what works best. This is something you probably need to go through to familiarize yourself with megaventory - but it’s not necessary. Secondly, or when you’re confident enough about the initial data you’ve already uploaded, you can start massively uploading information. 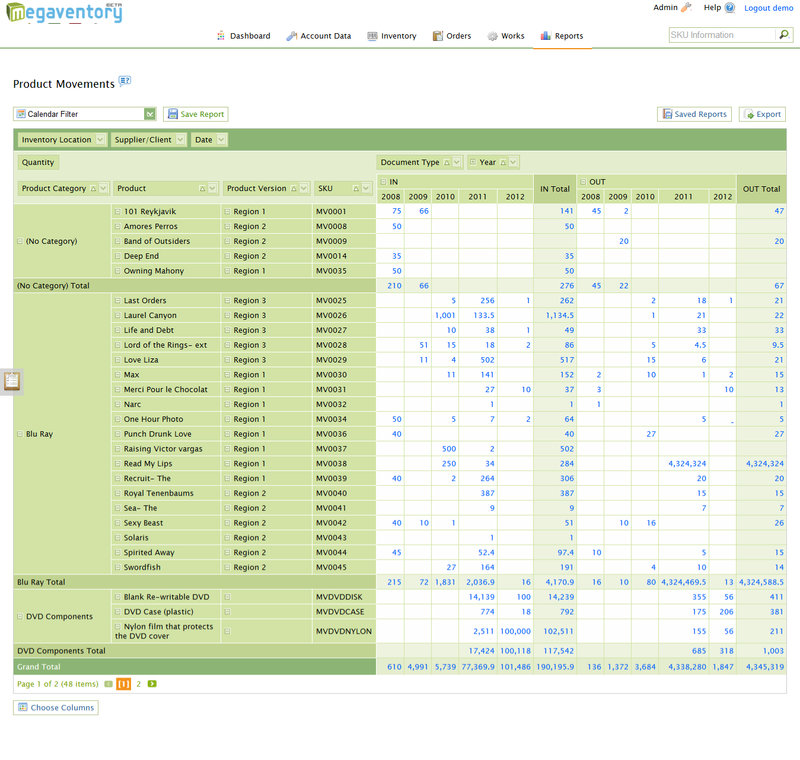 This is done with our handy import tool which covers most of the data that can be stored in megaventory. It’s really easy to get things online. Say, for example, we want to upload all our suppliers. 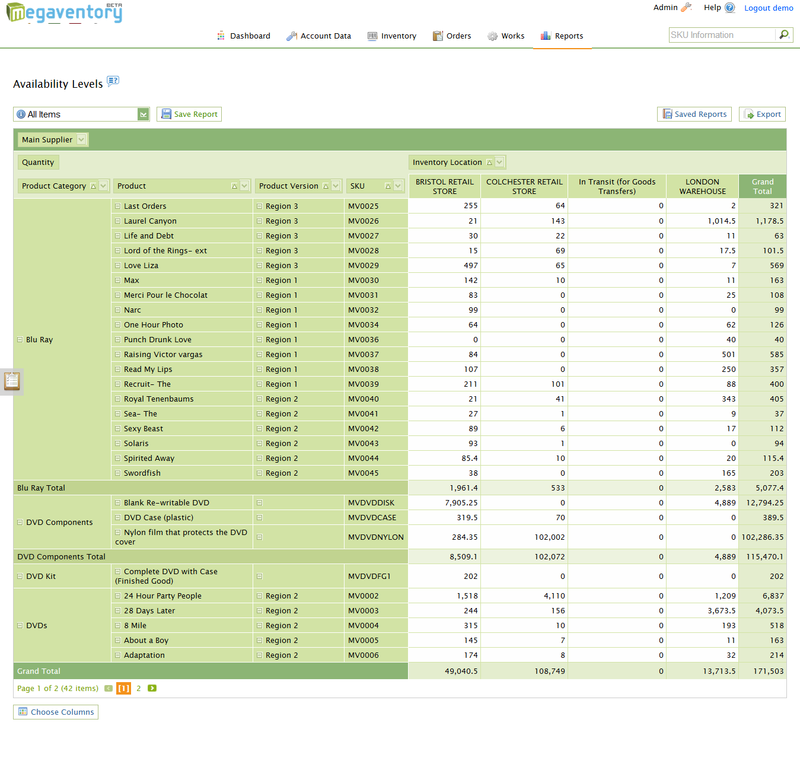 We click the second icon and proceed to download the special spreadsheet file by megaventory. Upon opening it we see its columns have already been constructed appropriately so all we have to do is fill in as many rows as necessary. Needless to say, fields that need predetermined values are filled in by drop-down menu to avoid problems due to a typo for example. Obviously, any data entry mistakes can also be corrected afterwards individually. And as expected once the data has been entered (or copy-pasted) we just need to upload the file. With a bit of preparation you could have your entire business online and ready in a few minutes! The importing feature is especially useful in two cases. For one thing when you’re just starting to insert your business in megaventory, you can do a couple of test imports manually (i.e. individually) and once you get the hang of it import with the tool the bulk of your data - and save loads of clicking. For another, when you have to import things regularly (e.g. new contacts or products) it can be a huge timesaver if you want to process data entry in batches. 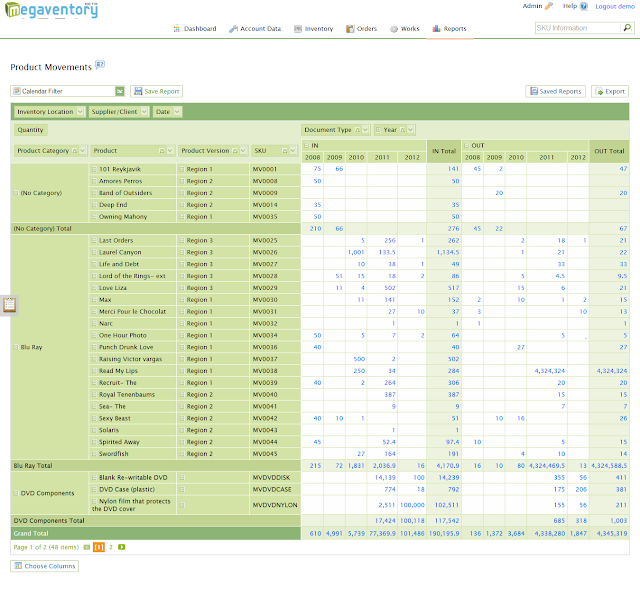 Just let some of the work gather, enter it all in the interim spreadsheet provided by megaventory and upload the lot in a few clicks. Who would use the import tool? Take for example laxtongroup.com, a company selling kiosk and touch screen related products among others. 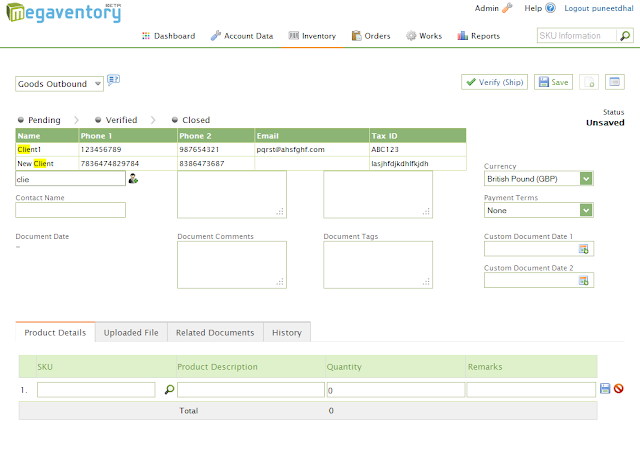 With various types of products, components and items to keep track, inventory management software is a must. Also, given that their products move relatively fast, the need to keep their catalogues up-to-date is no surprise and need to make heavy use of mass importing regularly. Depending on the size of your company and the turnover times of your business such simple features can save considerable time and effort from trivial tasks (while also preventing silly errors), resources that can then be redirected to more important things.